Min and I didn’t have to get up all that early today although I think we were up by eight anyway. We are going to be really exhausted by the time that we get back to Newark tonight. We have been getting hardly any sleep the last several days. I got back to work on the new Active Directory server this morning. I got almost everything done yesterday but ran into some migration problems caused by incompatibilities between Windows Server 2003 and 2003 R2. So I am continuing to work on that today. I also did some standard updates to the older machine just in case I need to keep it up and running for a while longer. I took both machines up to SP2 this weekend. That is a huge update. Around eleven everyone went down to Perry to get a late breakfast at the Hole in the Wall Restaurant. It is really cool that we came down here to eat on Dominica and my anniversary weekend because it was the old Hole in the Wall Restaurant that the groomsmen and I ate breakfast at before heading off to Wyoming for the wedding! In the picture here is our waitress from the Hole in the Wall this morning shooting a foul shot. 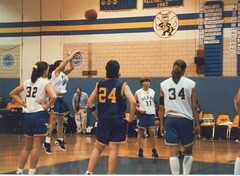 She played basketball for Perry around 1996 or 1997 when this picture was taken at a game against York Central School. I mentioned to her that I recently scanned this picture in and that it was online now and she said that she still has the poster of this picture hanging in her room. I made posters for almost everyone on the Perry team that year back when I still had access to the Kodak Camera Club darkroom complex in Rochester. After lunch we went back to dad’s and I got back to work on that server. In between attempts on the server Min and I did a bit of cleaning around in the garage. She managed to find, after much searching, some luggage that we really need. We also managed to eliminate an entire plastic bin of stuff that was being stored there. If we could just work our way through that much stuff on every trip we could eliminate the mess eventually. That is a tall order though. I finally found my box of telephone equipment that got packed up and moved from North Brunswick, NJ at some point and lost in the garage. I have put in a lot of time looking for this stuff. We will be taking that back down to Newark with us. Hopefully this will let us get our Vonage phone up and running again so that people can really call us instead of only being able to reach us over the useless Verizon wireless phone. Last night, I forgot to mention, dad helped me find the Netgear wireless access point that has been missing in the house as well. I got that set up this morning while I was working on other things. I got his Linksys WIP300 wireless VoIP phone working too. My grandparents and aunt Gayle left in the middle of the afternoon. I had enough to do before we could leave that Dominica really needed to do her homework for the week from dad’s house instead of waiting until we got home to Newark tonight. So she set up my laptop in the kitchen and worked on that. That gave me plenty of time to wrap things up and to do some more cleaning in the garage. Dad went down to Davis’ in Pavilion and picked up pizza for dinner. It was seven in the evening when Dominica and I finally managed to pull out of dad’s. Much later than we had been hoping but we didn’t have anything “hanging over our heads” for after we returned to Newark so we felt pretty good about the timing. It was a very productive weekend – visiting with the family from Ohio, anniversary dinner, worked almost a full day on Saturday, built new server, found missing wireless unit, fixed wireless phone, found missing phone equipment, found missing luggage, Min did her homework, etc. Route i81 in northern Pennsylvania has gotten to be so bad recently that we decided to take the alternative route going south on NY15 into Pennsylvania where it turns into the new i99 corridor. We took i99 down to Williamsport where we caught i180 to the east which took us down to i80 and that brought us back onto our normal route around Stroudsburg. Going this route had no traffic problems and allowed us to pull into Newark right at midnight. Only five hours of travel time inclusive of a fueling stop with food, drinks and two bathroom breaks. Not bad at all. During the trip I finished listening to the 25th Anniversary program of A Prairie Home Companion. Dominica slept most of the trip. Oreo was totally zonked. He got a lot of play time in this weekend with the other dogs and dad playing with him in the back yard. We also got a chance to talk to the neighbour about the house next door to dad’s. Unfortunately it is not for sale like we had heard in the rumours. So we are out of luck there.